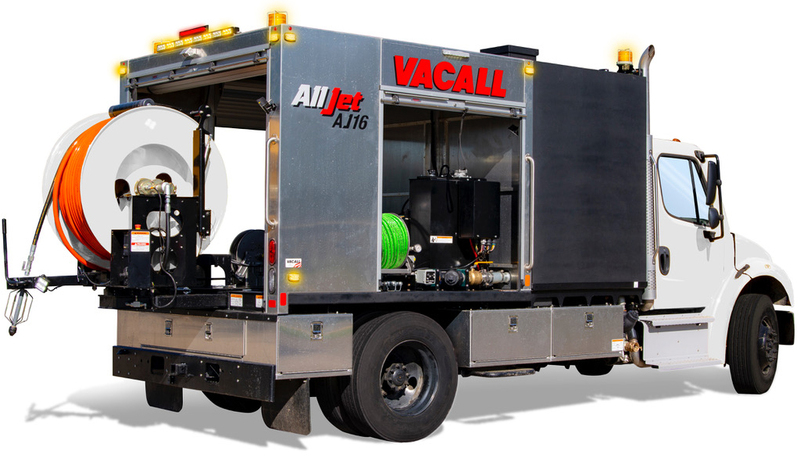 With standard Vacall "Green That Works" advantages, the AllJet uses a fuel-saving single-engine PTO design, a fully warranted 1,600-gallon UV resistant polyethylene water tank and Vacall's AllSmartFlow™ CAN bus control system. AllSmartFlow controls, protected inside a weather-resistant cabinet, help optimize operating efficiency with controls for water pump speed and pressure, hose reel adjustment, chassis engine and more. The hydraulically powered triplex plunger water pump is capable of 87 gpm @ 2000 psi, to effectively jet blockages in sewer lines and routinely maintain flow, with other power options available. The hose reel telescopes out 54 inches from a retracted position and swivels 200 degrees to properly direct the 600-foot, one-inch diameter jetting hose. The water tank is constructed with UV resistant black polypropylene, internally baffled with a filling system that runs through the tank, eliminating external plumbing. Operator-friendly features include four locking aluminum tool storage cabinets, a rear-view camera, three roll-up doors, a wash-down system and a number of popular options including LED lighting packages, an extendable rear canopy and a heating and insulation package inside the all-aluminum rear compartment. Designed for simplified operation to speed up emergency response to sewer line blockages, the AllJet chassis engine also operates the powerful jetting function, reducing fuel costs, emissions and maintenance associated with two-engine sewer cleaners. Vacall products are engineered, built and supported by Gradall Industries, Inc., with processes that meet ISO 9001 standards. Gradall is known worldwide for productive, versatile equipment for governments and contractors. For information and a demo, contact Vacall at 800-382-8302 or visit www.vacall.com. Learn more about AllJet. Or call 800-382-8302. Find your authorized distributor here. All Vacall machines are designed and manufactured in the U.S. at Gradall Industries' facilities in New Philadelphia, Ohio. Vacall products, wholly owned by the Alamo Group, are designed, built and supported by Gradall Industries, Inc., with processes that meet ISO 9001-2008 standards. Gradall is known worldwide for productive, versatile equipment for governments and contractors. Gradall Industries, Inc., may be contacted at 330-339-2211, or by mail to 406 Mill Ave. SW, New Philadelphia, OH 44663. Online, visit www.gradall.com.